It was one of those Mondays. My schedule was new. Again. It was occupational therapy day. Which meant that we made the four hour round trip to the therapy place. The kind of trip that the very tired kids fight all the way home. And so, I sat on the couch and did exactly nothing except make tacos for supper. I didn’t burn them so I count it as a win for everyone. It was as though a tidal wave of overwhelm washed through my living room tonight. And that word that seems to pop into my mind so much lately showed up again. Lately, it seems like it changes as soon as I get it written down on the calendar. I’ve been so busy. You know, that kind of busy…where you finally crash on the sofa and scroll through facebook on your phone while half-way listening to CNN on the TV in complete denial of the very real to-do list sitting on the table just hoping that the kids don’t drip their third popsicle on the rug. I guess I feel overwhelmed a lot. When I look at all the details, I see how less than capable I really am to do all this. I feel weak and helpless and like a failure. Self-check: It’s time to step-back. When I consider the landslide of change that’s going on in our lives, and has been going on since March, it would be an even more concerning detail if I weren’t overpowered by days like today. It is days like these that I’m forced to cry out to God in my weakness. I’m forced to look into the face of my need for guidance and protection. That’s probably the point, after all. A few days ago, I was flipping through the pages of my New King James Version study bible. My eyes rested on Psalm 61 just long enough to see the word “overwhelmed”. Cue sound of brakes screeching. I needed this Psalm. My heart needed this. I was desperate for help and rest. It’s rare that I don’t fret over why things happen. It’s almost only when I’m so exhausted that I can’t. I simply needed a moment of relief and safety. And in the median of my page I had previously sketched a tiny little tent and written “chuppah”. 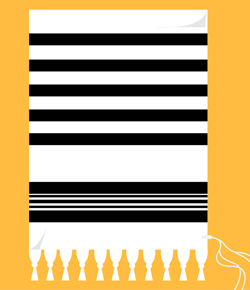 During some Jewish weddings, the requirements to fulfill chuppah is by the groom’s covering of his and the bride’s head with a tallit (prayer shawl). The word for the corners of a garment, including a tallit, is the same Hebrew word as wings, kanaph. The groom is covering his new bride, his new family, with his prayer cloth to symbolize their relationship with God. On the overwhelming days (and weeks), we can trust in our words given to a God who made that covenant with us — the promise to make us his own, to separate us from the unholiness, to protect us, and to listen to us. He doesn’t only want the people that have it all together; He accepts us in our weakness and does not expect perfection, only trust in our relationship with him. Please know that you are accepted. You don’t have to be whatever perfect looks like that day. You just have to be willing start a relationship. God is waiting there to cover us and claim us as his own. And no matter how you have been broken he offers hope and healing.